Image compliments of noaa.gov click to enlarge. 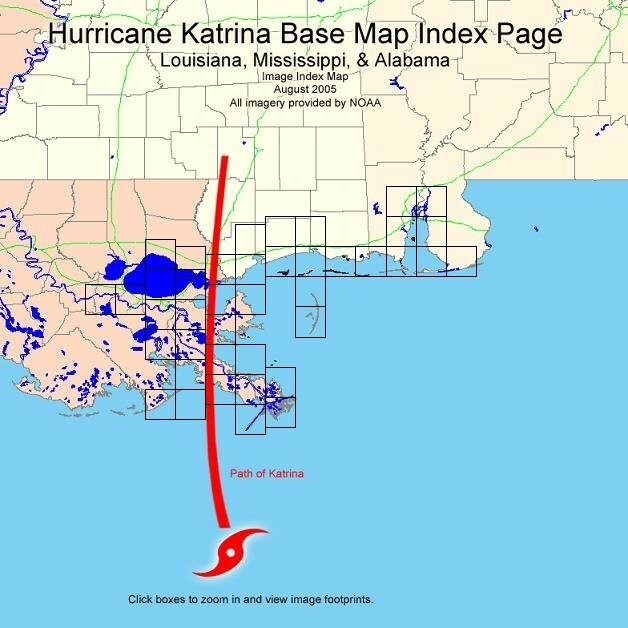 August 29th will mark the tenth (10th) anniversary of Hurricane Katrina. It was one of the deadliest and the costliest natural disasters in U.S. history. As you may recall, this hurricane touched down in Mobile, Alabama, and significantly damaged and left people stranded in New Orleans, Louisiana, and Biloxi, Mississippi during President George W. Bush administration’s second term as President of the United States of America. This primary source reference work chronicles George W. Bush’s second term presidency from July through December 2005. This volume includes the President’s remarks on Hurricane Katrina on Sunday, August 28, 2005, plus additional remarks on September 1, 2, 5-8,12, and an Address to the Nation on Hurricane Katrina Recovery from New Orleans, LA on September 15, 2005, a Memorandum on the National Flood Insurance Program on October 12, and more. This report is a summary of the Committee’s work to investigate the preparation for leading up to the Hurricane Katrina storm and the two weeks following the storm. It does not cover the extensive rebuilding of the impacted areas after the storm made its landfall to the cities and states that were in its’ path. This book, published in year 2011, covers the conceptualization of the initial attempts to use aircraft for evacuation, reviews its development and maturity through those conflicts, and focuses on the history of MEDEVAC post–Vietnam to the transformation of the MEDEVAC units from medical to aviation command in 2003 and the response to Hurricane Katrina in 2005. Much has been written about U.S. Army aeromedical evacuation—or MEDEVAC—and most works have focused on the war in Korea or Vietnam. This book focuses on the unique use of helicopters to accomplish this mission. Part I looks at the heritage of MEDEVAC from its beginnings in World War II through the bitter battles in Korea, the interwar years, and the long struggle in Vietnam. Part II covers the 1980s, a time of domestic duties and contingency operations. Part III reviews the turbulent 1990s with the end of the cold war, a hot war in the Persian Gulf, dramatic military force reductions, and a call to duty in the Balkans. Part IV stretches into the millennium, covering the events of 9/11, further conflict in Afghanistan and Iraq—the Aviation Transformation Initiative that moved MEDEVAC from medical to aviation control—and the national response to Hurricane Katrina. In general, after Part I, a thematic approach is used, and the chapters are organized with interweaving sections covering doctrine (service and joint), organization, and operations. This volume is the Air Education and Training Command’s (AETC) response to Hurricane Katrina as a pivotal event in the organization’s history. It showcases the men and women that rushed to the aid of their wingmen at the Kesslar Air Force base in Biloxi, Mississippi, and provided support for humanitarian efforts to the communities and the country in time of need. In addition to the coverage of Hurricane Katrina’s approach and landfall, this resource also attempts to cover the few months of recovery efforts that took place at Kesslar Air Force base during the aftermath of Hurricane Katrina. Within this commemorative 60 year anniversary of the National Guard, you will also find many accounts of the emergency response relief efforts during the historic Hurricane Katrina to include saving people stranded by the flood waters, supplying medicine food and clean water staples and more. Guide for citizens on how to protect themselves and their families against all types of natural and man-made disasters and hazards from tornadoes to terrorism, floods to fires, extreme cold to extreme heat. The “Are You Ready? An In-Depth Guide to Citizen Preparedness” from FEMA can be used as a reference source or as a step-by-step manual. The focus of the content is on how to develop, practice, and maintain emergency plans that reflect what must be done before, during, and after a disaster to protect people and their property. This entry was posted on Wednesday, August 26th, 2015 at 1:50 pm and is filed under Disasters, Emergency Response, Environment, FEMA Federal Emergency Management Agency, Gulf Coast. You can follow any responses to this entry through the RSS 2.0 feed. You can leave a response, or trackback from your own site.